The Urban Decay Naked Skin concealer caused waves throughout the online beauty community for being such a lightweight yet full coverage formulation but is it possible that there is a drugstore dupe? I was using the Urban Decay Naked Concealer thinking there was nothing possibly better but I needed a lighter shade for undereye highlighting. I told myself I would go out and purchase a lighter colour asap but in the meantime to just use up some other light concealer lying around. That's when I first tried the Maybelline FIT Me concealer that had been sitting in my draw of products to try for too long. I was shocked at how lightweight and watery the formulation was but how creamy and high coverage it also was. It reminded me so much of the Urban Decay Naked Skin that I knew I had to trial and test them both to see if they were dupes. - The same doe-foot applicator for precise concealing under the eyes. - The Maybelline one is slightly creamier and more velvety than the Urban Decay one, whether that be for good or for bad I think it is a personal preference. - The UD Naked Skin is slightly thinner in formulation, almost like an ink that actually soaks into the skin rather than sits on top of it. - The Maybelline one can look slightly powdery and cakey at times if not applied thinly enough. The Urban Decay Naked Skin Concealer retails for $36 and is available from Mecca. The Maybelline FIT Me concealer is less than half that retailing for $7.47 on sale at Chemist Warehouse or $14.95 full price. 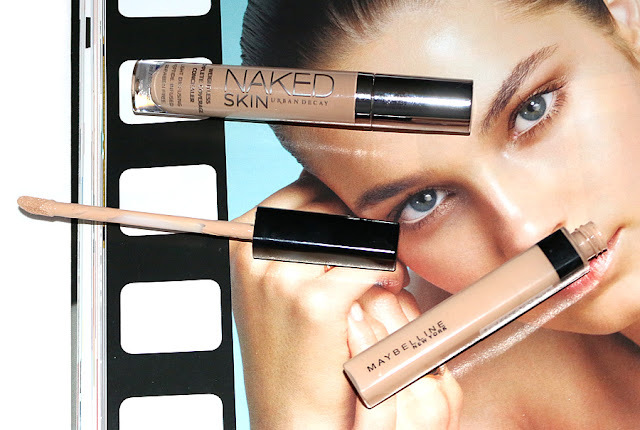 So my overall thoughts are that the Maybelline FIT Me concealer is definitely worth giving a try because if you can get it to work for you then it will end up saving you a lot of money. Concealer is one of those things that I go through quite quickly, just like foundation and brow products, so repurchasing expensive concealers can really burn a hole in your pocket fast.